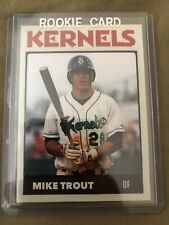 2013 13 BOWMAN MIKE TROUT BLUE SP PARALLEL 371/500 "ANGELS"
2012 MIKE TROUT PANINI BLACK FRIDAY DIAMOND KINGS FOIL RC #7 PSA 10 GEM MINT!!!! This page was last updated: 21-Apr 15:52. Number of bids and bid amounts may be slightly out of date. See each listing for international shipping options and costs.